Winger Albert Adomah says Middlesbrough must avoid overconfidence in Saturday's Championship game at Brentford off the back of the 2-0 FA Cup win at Premier League side Manchester City. Third-placed Boro are on a seven-game unbeaten run in all competitions, and have won their last three. Brentford, fifth in the table, have won their last three league games. 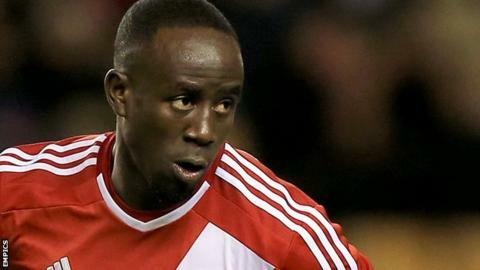 "Hopefully we can show up with our Championship attitude," Ghana international Adomah told BBC Tees. "That's the main focus, we can't think 'we beat Manchester City so it's going to be a rollover'. "It might turn out to be the other way round." Boro are currently maintaining their promotion push in tandem with their FA Cup exploits against Barnsley and Man City. This season is the Teessiders' sixth outside of the top flight following relegation in 2008-09, and a return to the Premier League remains the priority. "We're doing well in the Championship which is the main thing," added Adomah. "Everyone is watching the Championship and beating a bigger team is going to bring more attention to Middlesbrough. We've just got to focus." While the former Barnet and Bristol City winger has been a key figure for Boro, his national team Ghana have missed his presence for their African Cup of Nations campaign. Andre Ayew's goal put the Black Star into the quarter finals after a 2-1 win against South Africa, and Adomah has been keeping up with his team-mates from afar. "It's a shame that Ghana is missing me and I can only watch on television," he added. "I was hoping to stay here and be part of the promotion campaign and it turned out for the best for me. "I happened to get injured when I was supposed to meet up with the team, and unfortunately they told me not to travel. "But it worked out in my favour as I got to play against a bigger team in the FA Cup and do well in the Championship."